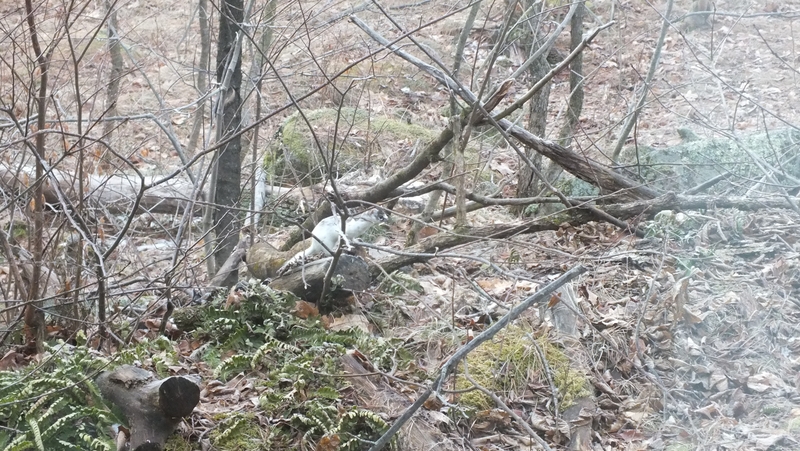 This spring brought an abundance of mammals to Sweetfern! To be fair, most were here all along, but only as the days began to grow longer, did we start seeing more than just their tracks in the snow. Perhaps they were feeling that urge to get out, find mates, expand territories, or look for new feeding opportunities. Happily we were able to get photos of many of our visitors, though a few slipped away before we could document them — one literally: I looked out my kitchen window and there was a North American river otter (Lontra canadensis) loping down the trail in the snow and taking up that tell-tale belly-slide for the downhill stretches. Barry grabbed the camera and dashed out hoping to get a shot, but the creature was too fast, sliding down the hill and disappearing into the woods. To preserve the record, we did photograph its tracks. 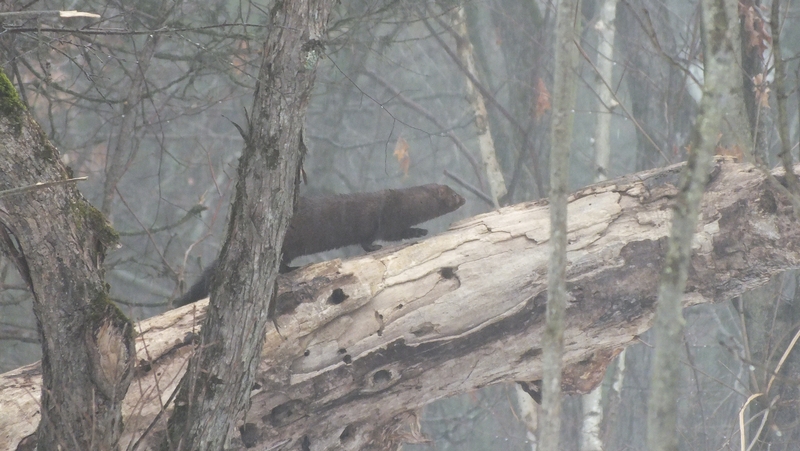 March was certainly the month for mustelids – a group of weasel-like carnivores (including the river otter) that hunt small prey on land and in water. 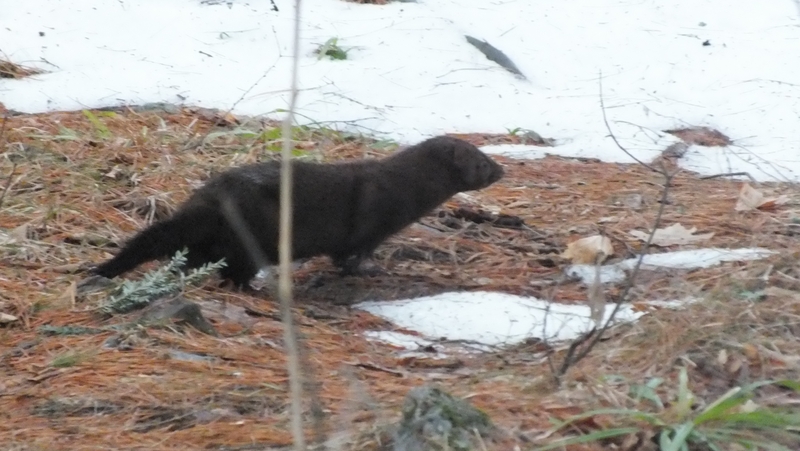 Here is the first mustelid visitor I was able to photograph, the American mink (Neovison vison). Mink are strictly carnivorous, preying on on fish, amphibians, crustaceans, muskrats, and small mammals. They are the most important species for the fur industry, but are seldom trapped for that purpose any more. Today fur farms raise mink by the millions. Regardless of your position on raising animals for fur, the activities of animal rights activists in releasing thousands of mink from fur farms into the wild, should be condemned. That reckless action is devastating to the mink and to the local ecology. You can’t just dump ten thousand carnivores into the countryside and expect the ecosystem or the animals themselves to survive. Aside from temporarily setting the farmers back financially (at least until their insurance payment arrives), nothing good comes of this activity. 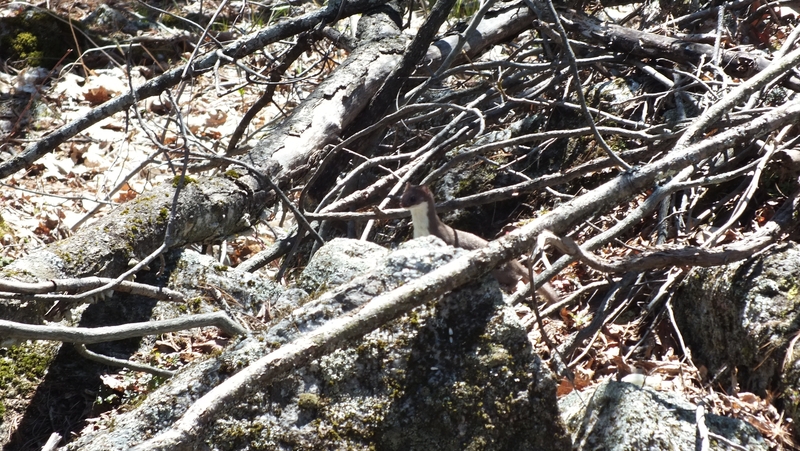 Another mustelid visitor was a short-tailed weasel (Mustela erminea). This animal thrives in all the circumboreal regions of the northern hemisphere. As such it has many names and is a good example of why standard scientific names are important. In Europe they are called stoats and are sometimes referred to as ermine when they sport their white winter coats. The first time I saw the stoat, it was transitioning between its white winter coat and its brown summer coat, in perfect concert with the surrounding terrain. 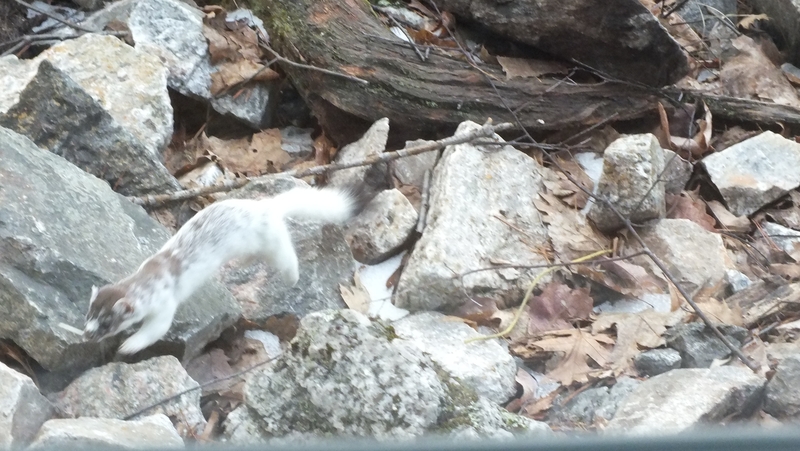 Here’s a better shot where you can see its identifying black-tipped tail. And finally, here it is in full summer dress, also well camouflaged. Now leaving mustelids, we move to some resident rodents. The American red squirrels (Tamiasciurus hudsonicus) and eastern grey squirrels (Sciurus carolinensis) — many of whom are actually black — were active all winter. The reds are chattery manic things. They entertained us all winter and spring with their parkour antics — bouncing over boulders, dashing across logs, and racing up and down tree trunks. They paused only to scold us or freeze in moments of alertness. That’s a grouse carcass. 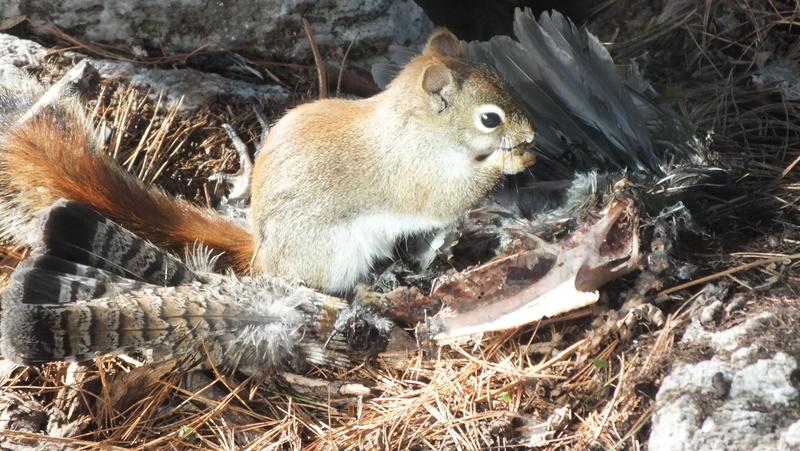 This squirrel worked on it for days, nibbling off small bits of meat and chewing on the bones. 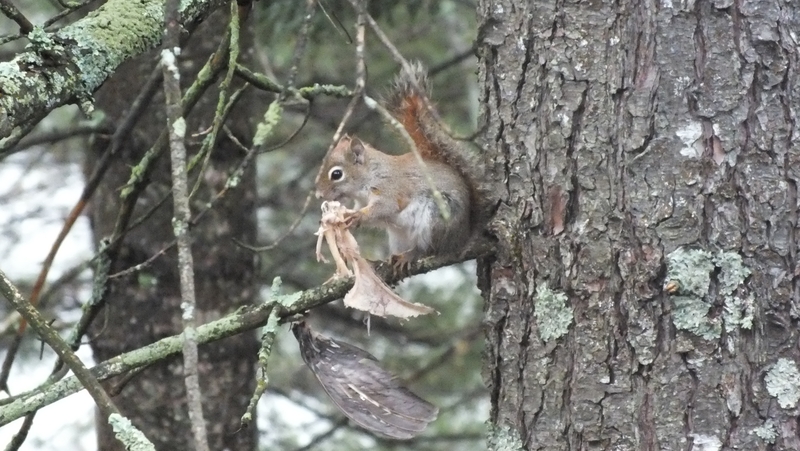 Eventually the breastbone and one wing separated from the rest of the carcass and the squirrel carried it up the tree to gnaw in relative safety. And all this nutrition paid off for one couple. 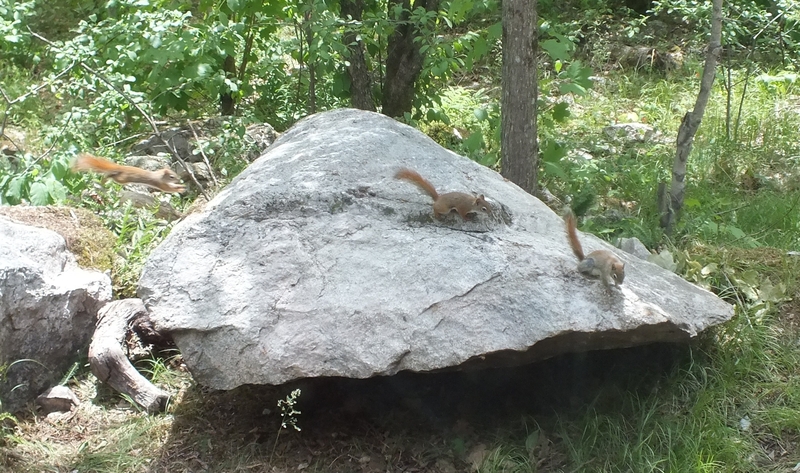 The end of May brought baby squirrels, here getting their first lesson in parkour. 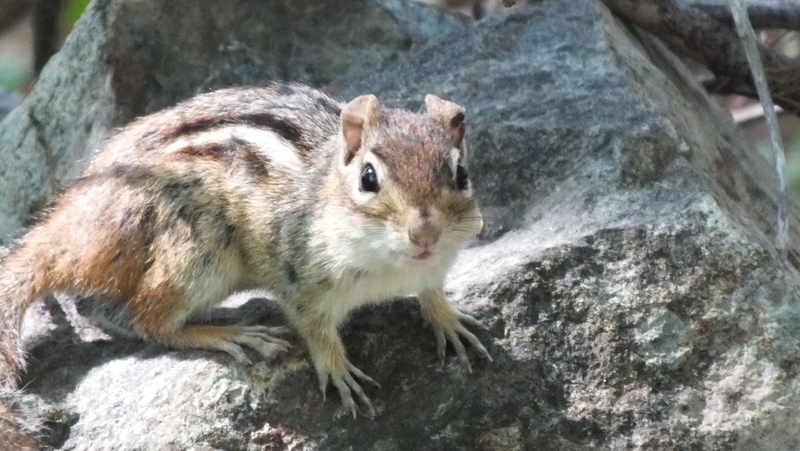 Our cute friends, the Eastern chipmunks (Tamias striatus), of course slept through winter. They emerged in April and have been busily eating and raising babies after a their long sleep. Is it me, or are his ears funny? Moving up to rodents of unusual size, look who I found hiding behind a tree! It’s a North American porcupine (Erethizon dorsatum), the third largest rodent after the South American capybara and the beaver. Porcupines are slow-moving because, well, they can be. No need to rush off when you have a coat of many quills. Contrary to myth, porcupines cannot shoot their quills. 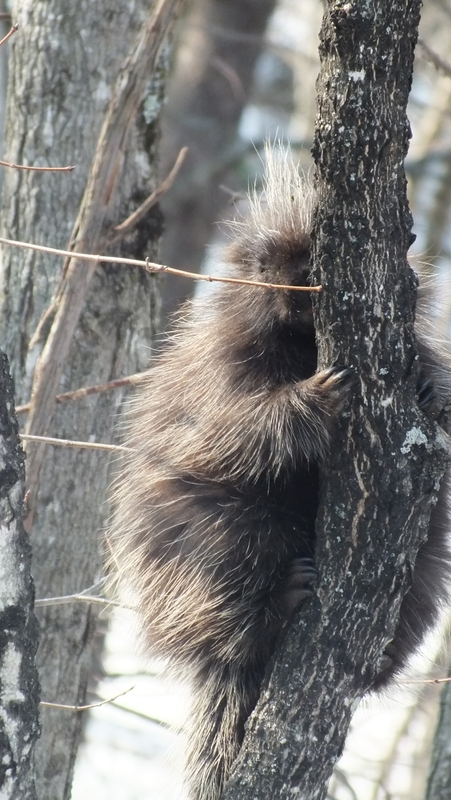 Porcupines are nocturnal, spending their days in holes in trees or rock caves. They do not hibernate in winter, but come out and chew what vegetation they can find, including tree bark. 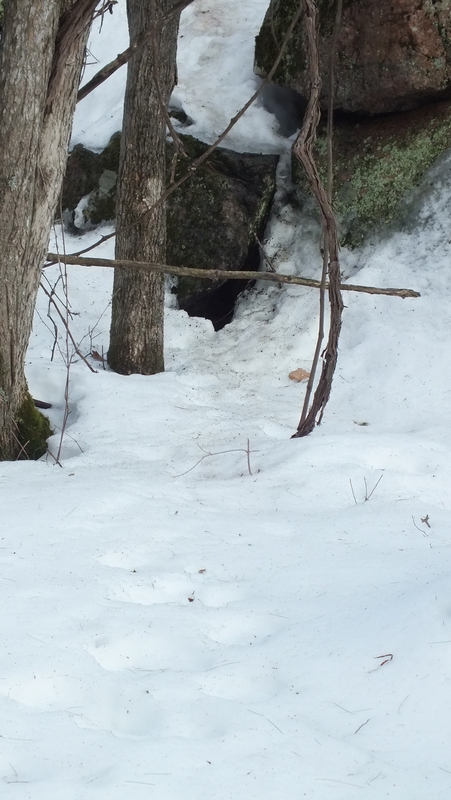 Here you can see the tracks from this one leading into a cave behind our house. And now for our biggest North American rodent. The property next to ours is undeveloped and includes a fairly recently-formed swamp, probably a result of clearing, and grading for an access road that was built to reach the waterfront. 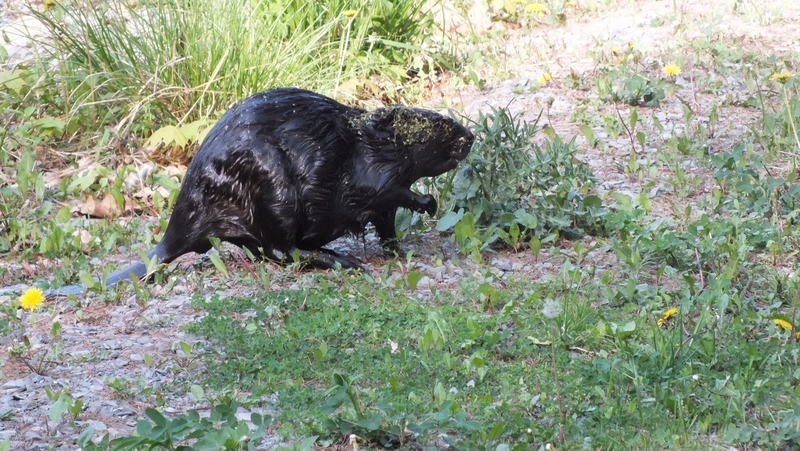 So, of course, where you find running water, you find American beavers (Castor canadensis) stopping it. The sound of running water is what triggers them to build dams. 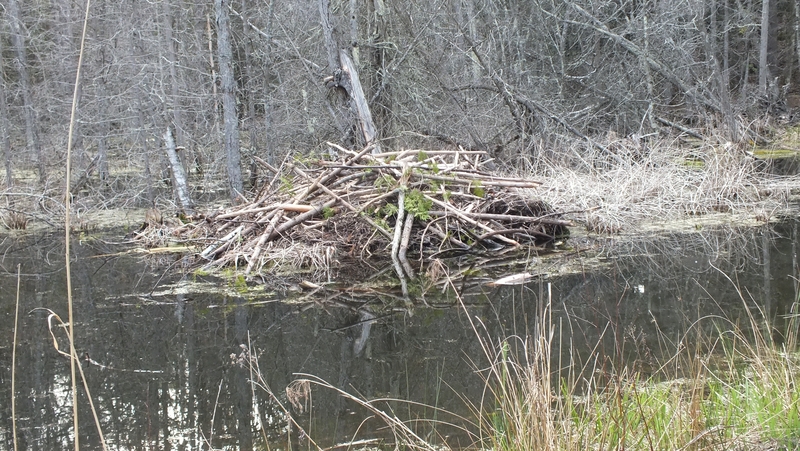 And sure enough, this little swamp has a lodge and a resident beaver family. I hardly saw the beavers in the early spring, but in the last month they have been very active and surprisingly assertive. Where they used to retreat, now when they see me they swim towards me and two or three times they have given the warning tail-slap on the water. 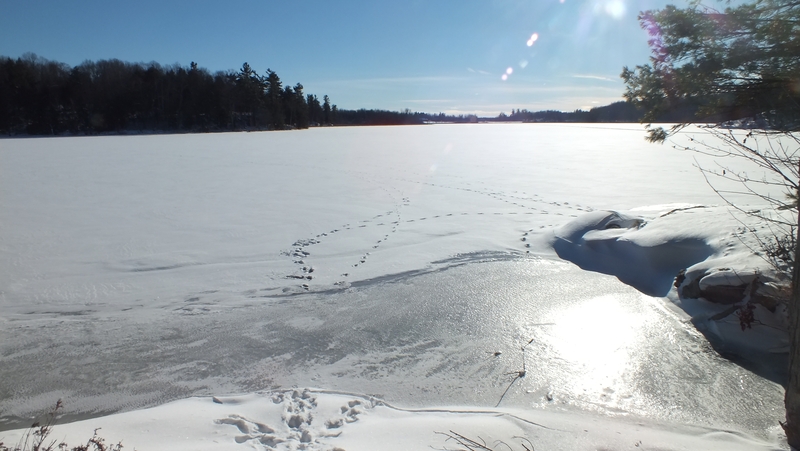 Moving onto bigger things, we heard the coyotes (Canis latrans) lots over the winter and early spring and found tracks like the ones in this picture, leading off across the lake. I did finally glimpse one loping along the far lake shore one day, but otherwise haven’t seen them. I had better luck with the red fox (Vulpes vulpes). Again, we found tracks in the snow, in one case leading right over the rock next to our house. Then, one night I was startled awake by the strangest sounds in the woods out back. I had no idea what it was. Then remembered, I had once written a blog post on spooky sounds in the woods. Sure enough, when I listened to the fox calls on that page, the one that starts at 1:30 in the video is exactly what I heard. (Creepy, no?) Finally, a few weeks ago we spotted the fox as we were driving in. No photo, but at least confirmed! Also proving more elusive than you’d expect considering how they roam through suburban neighborhoods, were the white tailed deer (Odocoileus virginianus). 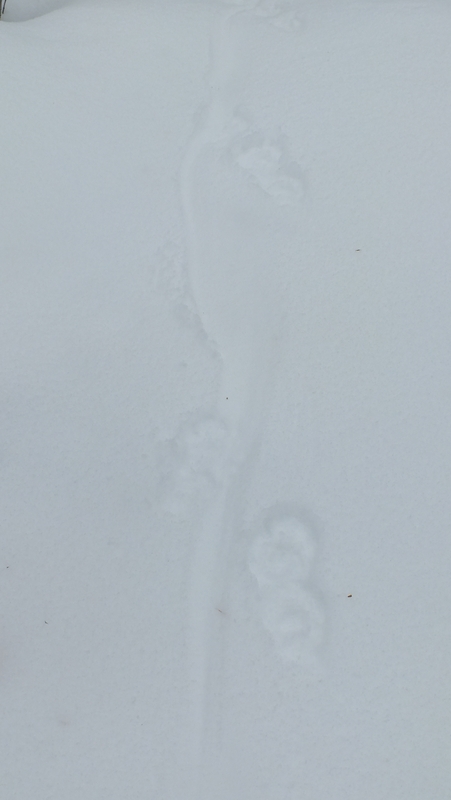 We had tracks running across the back of our property, but never laid eyes on the animals. Finally, just last week I spotted a pair managed to get one decent picture. And finally, from the Also Seen But Not Photographed Department, that masked troublemaker, the raccoon (Procyon lotor). We caught it prowling around our back porch and under the suet feeder one night a few weeks ago. It may explain why the suet disappeared so fast several weeks in a row. As are result, we’ve stopped feeding the birds. They don’t really need our help anyway, especially now that spring has sprung. So far those are the mammal highlights from here. Will let you know if anything else exciting makes a pass through Sweetfern.